ED Noor:This expose by Incogman is another invaluable tool in our struggle. 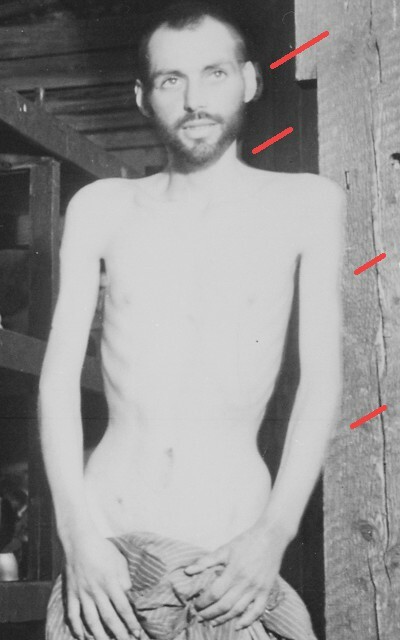 If you have not heard of Holocaust Photoshopping it is time you learned. I have many different opinions than Incogman on many topics but this information is just too important to be ignored. The mind is now too numb to be further confuddled by this overt boondoggle. For more of the same, please see his article: Too Bad They Didn’t Have PhotoShop Back Then! When I first ran my post here on Winston Smith’s brilliant efforts at obtaining an actual printed copy of the New York Times magazine from May 6, 1945; I also came across something else pertinent. 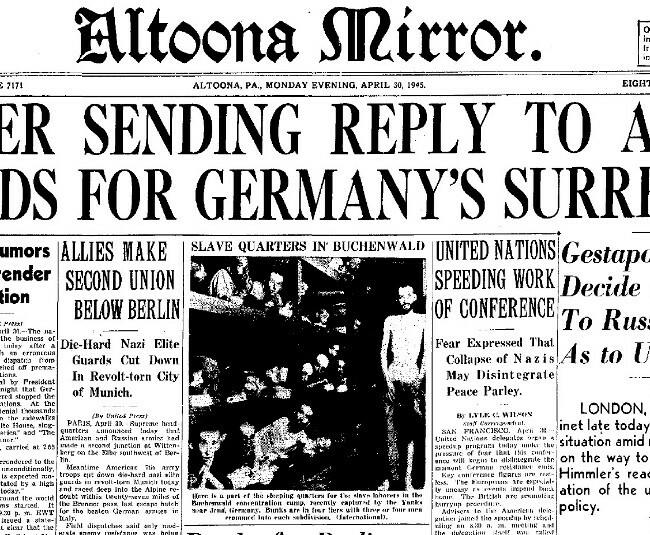 On April 30th, 1945, the Altoona Mirror in Pennsylvania ran the Buchenwald shot on their front page (above), but this one does have Mr. Naked Jew Guy in it ~ just like we see it today ~ but only 6 days later the New York Times (NYT) prints a photo with everything exactly the same (look at the poses of the ones in the bunks) ~ all except the naked Jew guy! Published in NYT magazine, May 6, 1945 (page below “continued reading” button). Where’s Mr. Naked Jew Guy? Now why is this such a big deal you might ask? Well, this tells us that the photo was altered shortly after Buchenwald was liberated on April 11, 1945 by elements of the US 9th armour division (no black hero dogfaces, either). Zionist OSS psyop agents and photogs didn’t arrive till the next day and the photo was supposedly taken on April 16th (12 days before the first US newspaper print on the 28th). My last post on this generated a few link backs from people on the Internet, like this one HERE. 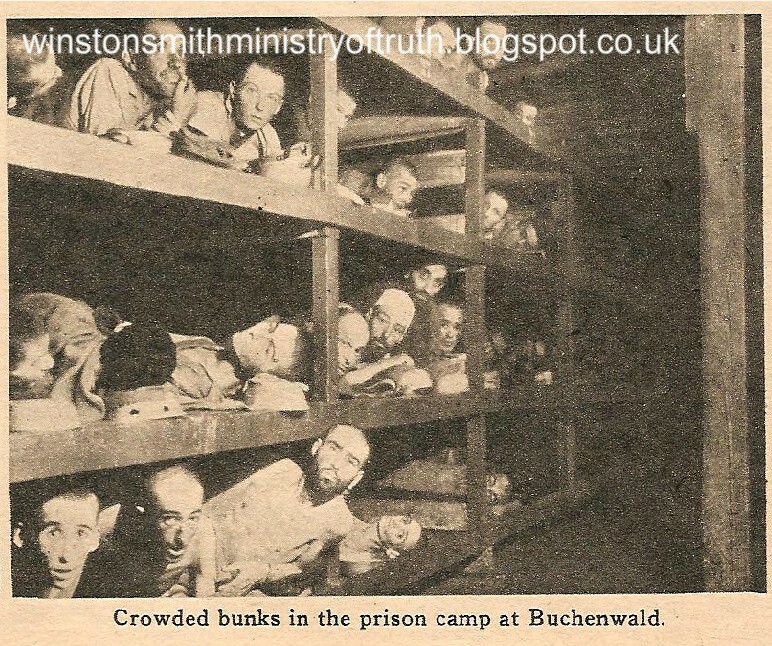 Of course, the stinking Jews at these places started jumping up and down (virtually, maybe even literally as well); saying the slight blur I pointed out around the Naked Jew’s head was only because the poor Jew was swaying back and forth due to all the evil Nazi business. But how the hell does that explain the published version where the Jew happened not to be there at all? I know what motion blur is and what’s not, trust me. The photo has all the signs of what is called “light leakage.” Yep, light can leak just like water. Enough photons made it under a very, very slight imperfection in the masking held down by a glass alignment frame and escaped out into the glossy emulsion side of the paper print (containing the light-sensitive silver halides). 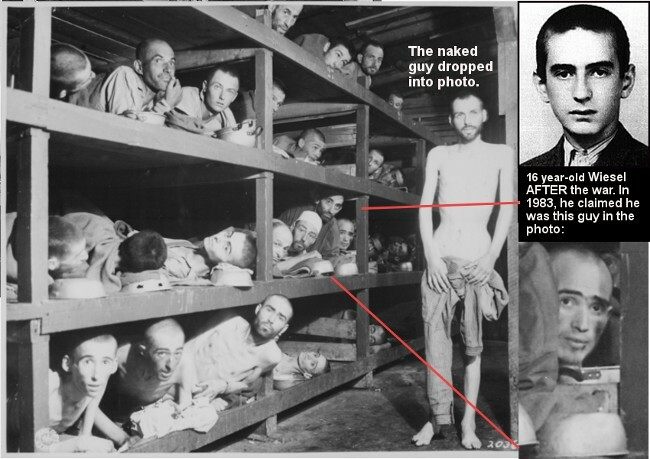 And sure, Mr. Naked Jew Guy could have been a real inmate, his photo taken later or even elsewhere. Again, that’s not the point. 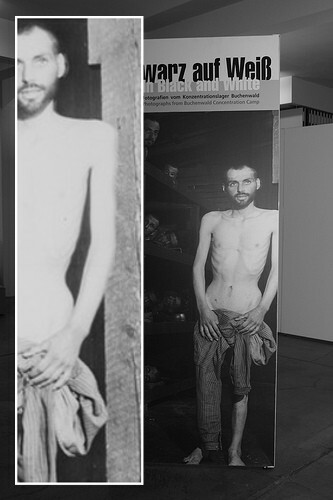 Many so-called “holocaust” photos have since been discovered fraudulent. 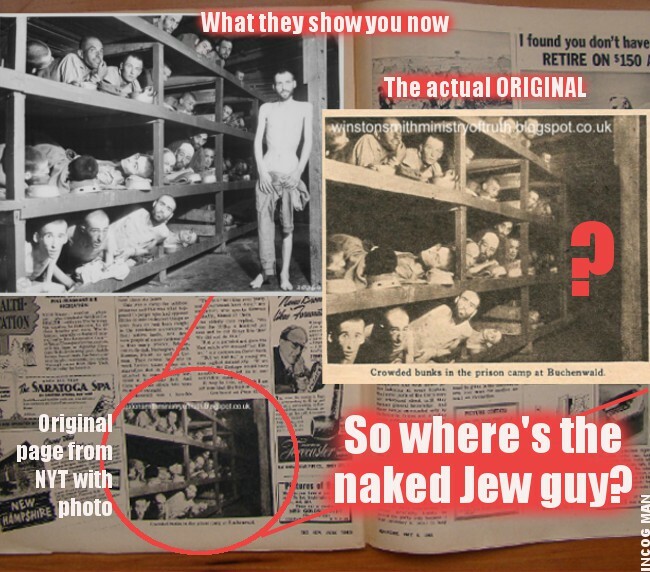 There are tons of “holocaust” photos exposed as fakes. You just don’t hear about it, because the bastards control the media. 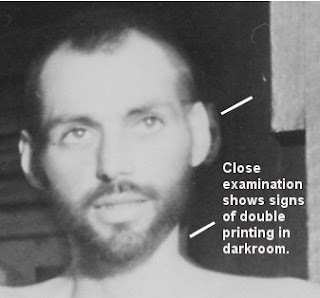 The best faked version of the Naked Jew Guy in the Buchenwald bunk room was soon flown back to US (they did have early wire transmission capability but it was slow and unwieldy). Copies were made back here for further use in the media, using offset printing and halftone dot screens, ever since. International Jewry was wild with glee all over. In the excitement of putting down the Jew-hating Nazis and Der Fuerher man, the NYT probably got a copy of the wrong print. Apparently, some photo editor in the editorial offices at the NYT passed the wrong shot down to engraving. The jerkwad Jews screwed the pooch big time. Figuratively, this time. “But INCOG MAN, what if it was just some creative, artsy-fartsy type back in the states who ordered it done, merely punch up the shot more?” Uh, the faked positive print was almost certainly created in a OSS or Reuters (NWO JEWS) darkroom only days after the camp was liberated (many US newspapers actually ran the Naked Jew Guy shot on April 28th ~ 2 days before NYT). Sure, I and all my fellow “White supremacist” readers here at INCOG MAN, don’t need any more convincing that all this holocaust crap is one friggin’ huge historical scam. But I’m hoping that you, a new visitor, might take the time to look at all the BULL in a different light and start thinking in ways the sorry mothers don’t want you to. Is that so much to ask? Signs of double printing along left side of Mr. Naked Jew Guy. Don’t you think HISTORY should be inviolable and free from absolutely ANY kind of lies and falsified political impediments? And that it should be fully part of “freedom of speech” for ANYONE to expose such matters? Don’t you understand all this holocaust crap has been used to manipulate our emotions for another race’s agenda to do whatever the flock they want in the USA and the entire GD civilized world? they can control the future. Now, I’m also certain there must be a few Jews who clearly know the photo was faked and would prefer not calling anymore attention to it, if possible. This is your typical Jewellian, down the memory hole, tactic. There are tons of books censored and removed from libraries all over America, targeted by a devious, self-elected, Jew police organization called the ADL. They’ve organized Jews all over to keep us Goy in the dark over a whole host of subjects. They even resort to surveillance tactics, free from any government control. The photo above is of Obama getting a guided tour of the Buchenwald museum in 2009. You can see that the photo crops out Mr. Naked Jew guy on the right. Other photos crop out the blurring on the figure’s left. Someone knows the deal. Buchenwald museum display cropped fuzzy left arm at just the right place. Why is this so important? All this may look like a little thing on the surface, but if you think it out, you’ll understand that it’s a big clue to the giant head job being done to the people of the West. It also tells us they have plenty enough internal control to keep silent about matters that could prove embarrassing to Jewry in general. In addition, they have enough safeguards in the media to protect it from the masses learning; should any one individual Jew get a conscious, want to come clean ~ maybe turn to Jesus ~ that danger is fairly well protected. Which has happened before. This possibility gets covered up by a little something that all of us already know plenty about: PC. Actually, any censoring of “self-hating” Jews really has nothing to do with PC when you get down to it ~ it only gets buried within the smokescreen afforded by this nefarious social taboo. I’ve always said PC is totally diabolical. There’s tons of stuff they purposefully keep you from knowing about right at this minute. They fully realize certain topics may get you worried, or even downright pissed, so they avoid like the plague calling attention to these matters. Ask yourself why you see tons of stuff on Adolf friggin’ Hitler, but hardly anything about the commies killing tens of millions of Christian Gentiles. It’s because they don’t want us White people to get a clue, that’s why. Same thing going on with all the crime and murder being done by blacks to White people right the flock now. Get this and get it good: The same forces behind all these holocaust lies having been lying across the board to this day. And it costs you with every paycheck, every trip to the grocery store, every trip to the gas station and every GD piece of BS crap they feed you on TV nowadays. 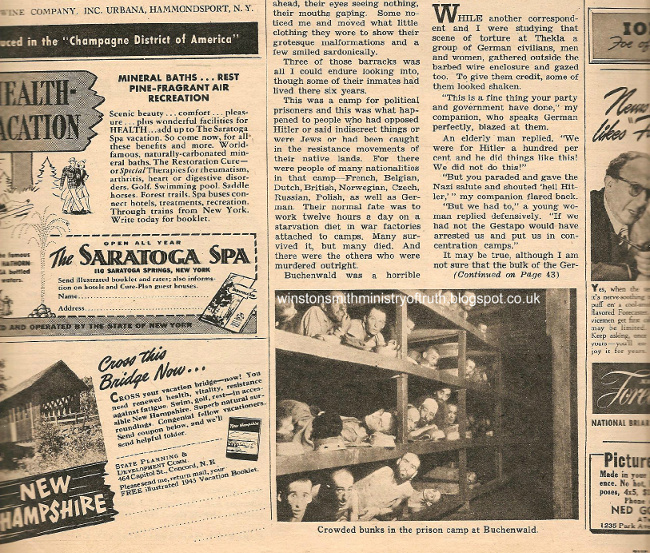 May 6th, 1945 NYT magazine (newspaper insert), page 42. From Winston Smith’s Ministry of Truth (click the ridiculous “I understand” button). * Look, I’m not at all trying to say the people (Jew or not) in the photos were faked. They were there, just the reasons for them looking so skinny and messed up is not explained fully. They want the general idiot public to think the evil Nazi Whites were completely responsible, so we need to cut them some slack in stealing Palestine and killing a few dirty A-rabs, right along with the traitorous Jews back here sliming up our country with sick crap, social and race upheavals and the flooding of our lands with non-White immigration. The “holocaust” is Israel’s most powerful weapon. Please go read my The Real Holocaust Deal to find out what really happened. Unless you’re just a little wus and too scared of people calling you a hater and all that jazz! ED Noor: Just to make things even more fun, Eli Weisel insists that he was also in this photograph. This "coincidence" would be just too amusing if it were not so serious. It is a miracle how Eli's hair grew back so thickly after his internment! .Must be his superior DNA! This article would make a good video. Especially the calculation that there were ever only 4.5 million jews under German control in WWII in any event. Further that there were 4.3 million claims by 'holocaust survivors' in the post war years. Somehow the figures just don't add up.